Attractions like Elephant Back Mountain and Beryl Spring make great kid-friendly stops. 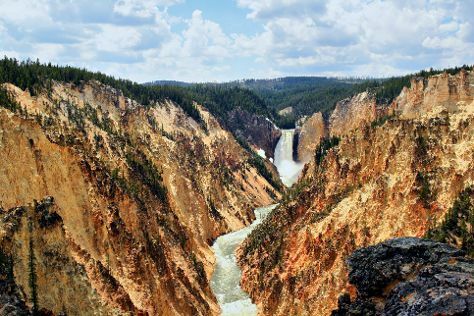 Spend the 6th (Mon) exploring nature at Yellowstone National Park. There's still lots to do: take in the natural beauty of Aurum Geyser, take in breathtaking views at Grand Canyon of the Yellowstone, trek along Osprey Falls Trail, and get impressive views of Monument Geyser Basin. To see reviews, maps, ratings, and other tourist information, go to the Yellowstone National Park vacation planning site . Hyderabad, India to Yellowstone National Park is an approximately 36-hour flight. You'll gain 12 hours traveling from Hyderabad to Yellowstone National Park due to the time zone difference. Expect colder temperatures when traveling from Hyderabad in May; daily highs in Yellowstone National Park reach 13°C and lows reach -3°C. Cap off your sightseeing on the 7th (Tue) early enough to travel to Niagara Falls. Start off your visit on the 8th (Wed): admire the majestic nature at Reservoir State Park, trek along Niagara Wine Trail USA, and then admire the sheer force of Bridal Veil Falls. On the 9th (Thu), you'll have a packed day of sightseeing: tour the pleasant surroundings at Niagara Gorge Trail, then explore the fascinating underground world of Cave of the Winds, and then admire the sheer force of Niagara Falls. To find traveler tips, ratings, reviews, and more tourist information, read our Niagara Falls trip itinerary planner . Traveling by combination of car, flight, and bus from Yellowstone National Park to Niagara Falls takes 10 hours. Alternatively, you can do a combination of car, flight, and train; or drive. You'll lose 2 hours traveling from Yellowstone National Park to Niagara Falls due to the time zone difference. When traveling from Yellowstone National Park in May, plan for a bit warmer days and much warmer nights in Niagara Falls: temperatures range from 24°C by day to 11°C at night. Finish your sightseeing early on the 9th (Thu) to allow enough time to travel to Orlando. You'll visit kid-friendly attractions like Walt Disney World Resort and Universal Orlando Resort. Pack the 11th (Sat) with family-friendly diversions at Universal's Islands of Adventure. Have a day of magic on the 12th (Sun) at Magic Kingdom Park. For where to stay, reviews, maps, and tourist information, use the Orlando vacation planner. Fly from Niagara Falls to Orlando in 5.5 hours. Alternatively, you can drive; or take a train. Traveling from Niagara Falls in May, expect Orlando to be a bit warmer, temps between 36°C and 24°C. Cap off your sightseeing on the 13th (Mon) early enough to travel to New York City. You'll visit kid-friendly attractions like Central Park and The Metropolitan Museum of Art. There's lots more to do: enjoy breathtaking views from Empire State Building, pause for some photo ops at Statue of Liberty National Monument, pause for some serene contemplation at St. Patrick's Cathedral, and see the interesting displays at New York Public Library. Fly from Orlando to New York City in 6 hours. Alternatively, you can do a combination of flight and bus; or drive. Prepare for slightly colder weather when traveling from Orlando in May: high temperatures in New York City hover around 24°C and lows are around 15°C. Finish your sightseeing early on the 17th (Fri) to allow enough time to travel back home.